Chris Anley is a founder and director of NGSSoftware, a security software, consultancy, and research company based in London, England. He is actively involved in vulnerability research and has discovered security flaws in a wide variety of platforms including Microsoft Windows, Oracle, SQL Server, IBM DB2, Sybase ASE, MySQL, and PGP. John Heasman is the Director of Research at NGSSoftware. He is a prolific security researcher and has published many security advisories in enterprise level software. He has a particular interest in rootkits and has authored papers on malware persistence via device firmware and the BIOS. He is also a co-author of The Database Hacker’s Handbook: Defending Database Servers (Wiley 2005). Felix “FX” Linder leads SABRE Labs GmbH, a Berlin-based professional consulting company specializing in security analysis, system design creation, and verification work. Felix looks back at 18 years of programming and over a decade of computer security consulting for enterprise, carrier, and software vendor clients. This experience allows him to rapidly dive into complex systems and evaluate them from a security and robustness point of view, even in atypical scenarios and on arcane platforms. In his spare time, FX works with his friends from the Phenoelit hacking group on different topics, which have included Cisco IOS, SAP, HP printers, and RIM BlackBerry in the past. Gerardo Richarte has been doing reverse engineering and exploit development for more than 15 years non-stop. In the past 10 years he helped build the technical arm of Core Security Technologies, where he works today. His current duties include developing exploits for Core IMPACT, researching new exploitation techniques and other low-level subjects, helping other exploit writers when things get hairy, and teaching internal and external classes on assembly and exploit writing. As result of his research and as a humble thank you to the community, he has published some technical papers and open source projects, presented in a few conferences, and released part of his training material. He really enjoys solving tough problems and reverse engineering any piece of code that falls in his reach just for the fun of doing it. Part I: Introduction to Exploitation: Linux on x86. Chapter 1: Before You Begin. Chapter 4: Introduction to Format String Bugs. Chapter 5: Introduction to Heap Overflows. Part II: Other Platforms—Windows, Solaris, OS/X, and Cisco. Chapter 6: The Wild World of Windows. Chapter 10: Introduction to Solaris Exploitation. Chapter 11: Advanced Solaris Exploitation. 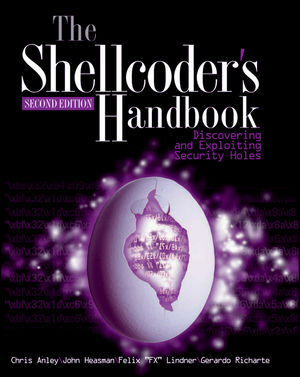 Chapter 12: OS X Shellcode. Chapter 13: Cisco IOS Exploitation. Chapter 15: Establishing a Working Environment. Chapter 17: The Art of Fuzzing. Chapter 18: Source Code Auditing: Finding Vulnerabilities in C-Based Languages. Chapter 19: Instrumented Investigation: A Manual Approach. Chapter 20: Tracing for Vulnerabilities. Chapter 21: Binary Auditing: Hacking Closed Source Software. Chapter 22: Alternative Payload Strategies. Chapter 23: Writing Exploits that Work in the Wild. Chapter 24: Attacking Database Software. Chapter 25: Unix Kernel Overflows. Chapter 26: Exploiting Unix Kernel Vulnerabilities. Chapter 27: Hacking the Windows Kernel.